Malcolm Fraser became Australia's 22nd prime minister when the Liberal Party won office, following the dismissal by the Governor-General of the Labor government led by Gough Whitlam. 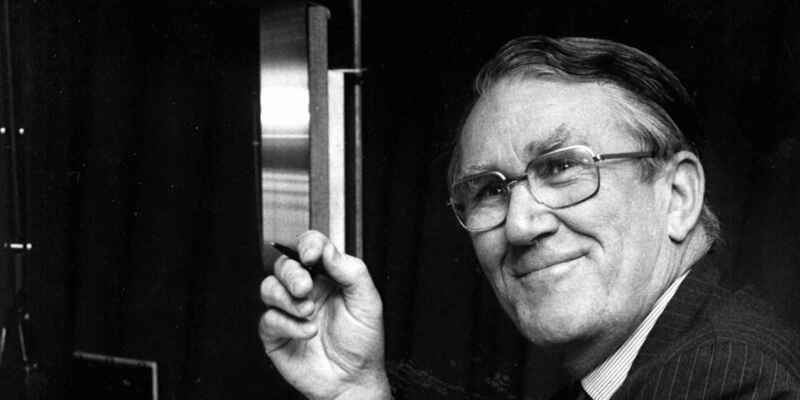 Malcolm Fraser was an economic traditionalist and a social reformer, particularly in the areas of immigration and multiculturalism. He believed in order, and proper process, and mastered collective responsibility and the machinery of government. Yet he was also willing to engage in brinkmanship to achieve political goals, and this won him both admirers and enemies. Malcolm Fraser's challenge was to become known in his electorate of Wannon before Liberal preselection in November 1953, given his years away at Oxford and his youthful shyness. His preselection win was unexpected and, though he lost the 1954 election by 17 votes, he won convincingly in 1955 to become the youngest member of the Menzies government. When Harold Holt became prime minister in 1966, Fraser was appointed Army Minister, and then followed roles as Minister for Education and Science, Minister for Defence and Leader of the Opposition. Fraser became caretaker prime minister in November 1975, following the dismissal of the Whitlam government, and won a decisive election victory in December. He lost government and left the parliament in 1983, and his party in 2009. The first legislation passed by an Australian Government to legally recognise the Aboriginal system of land ownership. Immigration policies and programs are brought together again in a new department, with the addition of ethnic affairs reflecting its role in migrant settlement. Australian Defence focused on the defence forces being able to operate in Australia's maritime region with a clear emphasis on self reliance. The new Federal Court’s jurisdiction is broad, covering almost all civil matters arising under Australian Federal law and some summary and indictable criminal matters. The first CHOGRM meeting of Pacific Island Commonwealth states is held in Sydney, convened by Fraser in collaboration with Indian Prime Minister Morarji Desai. The AFP is formed from the Commonwealth Police, the Australian Capital Territory Police and the Federal Narcotics Bureau. The catalyst for its formation was the Sydney Hilton Hotel bombing. AIMA is established to raise awareness of cultural diversity and promote social cohesion, understanding and tolerance. Full time multicultural broadcasting begins in Sydney and Melbourne on 4 October 1980, with a documentary on multiculturalism entitled Who are we ? Australia's first federal Human Rights Commission is established. The Freedom of Information Act provides a legal right of access to government documents and enhances the transparency of government activities. 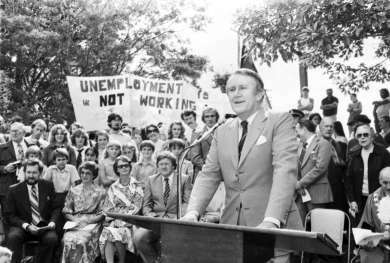 Prime Minister Malcolm Fraser giving a speech to local residents at Jackson Park, Faulconbridge, 30 March 1979. 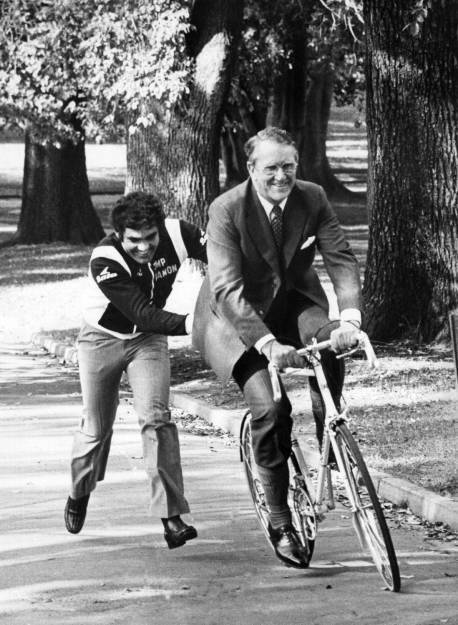 Following the dramatic 1975 election, the Fraser Government enjoyed a majority in both houses. The Liberal-National Country Party Coalition continued with, and adapted, legislation initiated by the Whitlam Government including the passage of the Aboriginal Land Rights Act for the Northern Territory in 1976, followed by the Aboriginal Development Commission Act in 1980. The Fraser Government's legislative program also increased immigration numbers, with about 200000 arriving from Asia between 1975 and 1982. Included in this were approximately 56000 Vietnamese and other refugees from Indochina who had been displaced by the Vietnam War. The 1976 Defence White Paper, in the wake of significant changes in the region, was considered a breakthrough in independent thinking. In difficult economic times, Fraser's policies hinged on restraint: he devalued the Australian dollar and retained Medibank by allowing it to compete with private hospital funds on hospital accommodation. Against a backdrop of drought and international recession, the 1982-83 budget included stimulatory measures and a modest deficit, reflecting Fraser's approach to the worsening economic environment. Fraser’s combination of social progressiveness, realism, a strong work ethic and commitment to government integrity in a climate of distrust, coloured his interactions within his Government. Unease within his party over actions that brought him to power, notably the train of events following his resignation as Defence Minister under John Gorton, remained. During his leadership he sought advice and consulted widely with ministers, his ministerial team, and experts outside government, gathering options and finally exercising judgement. His consultative style brought him what he most admired – arguments from ‘the best minds that could be assembled’ but his closest links were with Doug Anthony, leader of the National Party and a dairy farmer and Peter Nixon, a grazier, who shared his farming interests. Fraser preferred argument as a tool to work out his own ideas. Sir Arthur Tange, former Secretary of External Affairs and High Commissioner to India, was Secretary of the Department of Defence during much of Fraser’s prime ministership, and was prepared to take him on. Fraser recorded that they never stopped arguing, that if ‘he thought I was making a wrong decision’ he would say so, making him a very ‘comforting person to have around’. On Fraser’s style Tange recorded that he had opinions, often impetuously formed, about most things, and expected his advisers to disagree with him. Both were activists and accustomed to each other’s style. Tange had worked with Fraser as Defence Secretary in 1970, setting in train merging the Army, Navy and Air Force. Their determined effort achieved the opening of Australian Defence Force Academy in 1983, and their discussions spanned international issues including the American alliance and access to European markets, until Tange retired in 1979. Fraser's press secretary David Barnett orchestrated his daily routine, to which was added electorate work. He wrote Fraser 'was a decision-making machine... on planes, in cars, at home or on the farm...late at night, when appointments were over and the rest of Australia had turned off the telly...' Outside his work his ordinary interactions were with his family and country people. His voters expected him to be accessible and approachable. One man, who said he couldn't vote for Fraser without knowing his policies, suggested they adjourn to the pub after the first 20 minutes. A farmer, Fraser was in demand to open country shows and talked comfortably and at length about issues including drought and recession, but did not manage small talk well.